little lesiw Giveaway…OMG You Have To See These! My girls always have a bow in their hair…always, always, always! So when I saw Little Lesiw hair blooms recently at the Baby Celebration L.A. show, I almost knocked over a few people to get to them! They come in full size blooms and itty bitty’s, which means you can full size bloom your princess or itty bitty bloom your tiny one! The best part is that little lesiw was started by a mom, run by a mom and every little lesiw hair bow you receive has it’s own little peice of love poured right inside! little lesiw has been operating on etsy and because of their popularity (as you can imagine), they are in the process of switching over to their very own website, permanently saying goodbye to etsy. 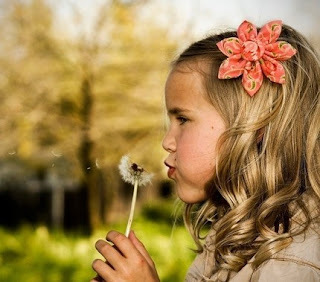 That means you can grab some little lesiw hair blooms for a rockin’ price right now! You’ll find hair blooms starting at just $5 (reg. $12) and pairs starting at just $8! Not only will you score a rockin’ deal, but every item you purchase from little lesiw’s etsy shop will gain you an entry into little lesiw’s current giveaways! And that’s not all! 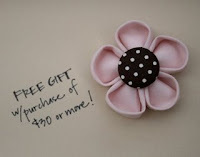 For every $30 you spend at little lesiw’s etsy shop, you’ll receive a *FREE* Daisy Bloom! Stock up now, because once the new site is launched, they will return to full retail price! Visit little lesiw’s etsy shop and little lesiw’s blog to find out all of the details for the giveaways, but HURRY giveaways end on June 6th!! I’m not done yet!!! How about winning some little lesiw hair blooms right here, right now! 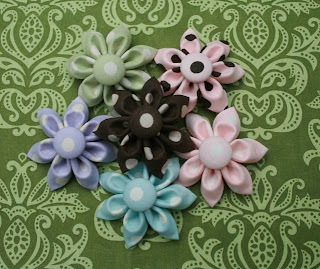 Oh yea…one “Deal”ectible Mommies reader will win the polka dot bloom set pictured below!!!! Which btw, you can purchase right now for only $20!! Simple entry: Just visit little lesiw’s etsy shop and take a look around…come back here and tell me what little lesiw hair bloom you love the most! 2. Subscribe to “Deal”ectible Mommies by Email or Subscribe to my feed. 3. Follow “Deal”ectible Mommies…You can Follow My Blog on my sidebar..hint: It’s at the very top! That’s a total of 6 entries possible…Good Luck! The boring stuff: Open to U.S. and Canadian residents only. Giveaway will end on Friday June 12th at Midnight! Winner will be chosen using random.org! Briny Baird & P.F. Chang’s Offers FREE Lettuce Wraps to America! Our Third Year Anniversary is Quickly Approaching!